Hello Crew, I would like your opinion on mixing corals. I have a 125 gal reef tank that has been set up for about eighteen years. Originally, it was full of LPS corals. Superstorm Sandy hit and wiped out everything but mushrooms, two lobos and an Acan which are still going strong. To make things easier for myself, I re-stocked with all the typical leathers- Sinularia, Nephthea, etc. Fish inhabitants are a niger trigger, Picasso trigger, yellow pseudo and huge hippo tang, which survived Sandy. The fish ignore the lobos and Acan. What do you think of my plan of adding a few trachys, lobos or Euphyllia to the bottom? I have a frogspawn and I am getting another one in the mail . Can I put them next to each other or do I have to treat them as enemies. They are both the same color, green with purple tips. to get this information. Most of the articles relate more to identifying each type and where they are found but very few talk about placement and feeding. You have to go through answers to get most of that. It would be nice to have a quick lookup of some sort. Or at least, as in some articles, there is a paragraph about placement in tanks and feeding. <Sam, here is a link to a site with good general information on corals. I believe you will find this information useful. Scroll down, look. I had a really disastrous day with regards to my tank today. My huge Seriatopora caliendrum broke free of the putty holding it in place and came crashing down onto my Bubble Coral. When I removed it the Bubble Coral was still extended but has obviously been stung all over. There are little white dots all over the polyps and at times during the day it looked a little deflated. It still has it's tentacles out, is that a good sign? Quite a few small pieces of the Seriatopora were breaking off which I clipped and mounted on frag plugs. It has obviously also been stung by the Bubble coral as its polyps on the top branches, where it made contact, look almost squashed. It has secreted a lot of mucus during the day but there are no signs of any bleaching yet. Are these corals likely to recover? Is there anything I can do, or is it just a question of giving them time to recover themselves? I have secured the Seriatopora with a lot more putty of a stronger type so it is firmly in place this time. I also have a question regarding Sun Coral. Does every individual polyp need to be fed? How often should I be feeding it? Just in need of your advice again please. The bubble coral seems to be doing fine, the Seriatopora not so fine. It's bleaching and losing flesh in a few places on the top branches where it was touching. Is it imperative that I clip these branches off to stop this from spreading? This may be very difficult as the coral is in a strong flow area and has grown very thick, tightly packed branches, which almost appear to be fused with other branches. Is it possible for the flesh and polyps to recolonize the dead parts of the branches? It will be such a pity if I have to cut these branches as I will lose a lot of healthy parts caught in between two bleaching areas. Hello!? Sorry about all the question marks, for some peculiar reason my e-mail system tends to place them randomly.? Anyway, I have a JBJ 24 gallon nano.? It has 32.5# live rock (Vanuatu, Fiji, Tonga) and 40# of pink Fiji sand.? The system is a little over a month old and only has a pearly jaw. I do about 10% weekly water changes with premixed R/O saltwater.? I do keep a Polyfilter in chamber 1.? I had the lid recently upgraded with a 3rd 36w watt bulb, bringing the total wattage to 108w.? SG 1.0255, ammonia 0, nitrite 0, nitrate 10 ppm, pH 8.2? There is a Koralia 1 power head in the display and a maxi 1200 for the return pump. I was dosing 3.75 ml of 2 part b-ionic the last 4 days (recommended for a 15 gallon volume).? I immediately performed a water change and will resume 2.5 ml (recommendation for a 10 gallon volume) in a few days and retest.? I knew something was odd when brown algae and brown hair algae started sprouting here and there. I did have a temperature variance problem but that was resolved by a cheap $7 fan blowing on my lid.? I was skeptical of the advice but it worked!? Temperature only goes from 79 to 81 now versus the 79 to 84ish!? I'm still shocked at how well that worked out, thanks for the advice!? I usually read the Coralife digital thermometer, but I have the glass one in the tank as well just to make sure it's in check as suggested. My real question is to clarify something.? I was thinking mostly stocking one particular family of coral in my tank, Caryophylliidae.? Frogspawn, torch, hammer, elegance, and bubble coral.? I'd like to do this to limit corral aggression.? However, when reading through FAQ's I see that although they are in the same family, these corals still can fight with each other and cause adverse reactions if within close proximity?? Correct me because I'm probably wrong, but I thought since they were in the same family, their aggression between each other would be futile??? I guess even families have feuds within themselves??? Ecsenius lineatus… Munching On My Corals 9/2/07 Hi Crew, <Hi Peter, Mich here.> Just wanted to give you guys a heads up. I use your site for researching new additions to my tank all the time, and always recommend you to others through the various BBs. <Thank you. Is wonderful to hear that you value what you find here.> I have never come across this info so I though I would share. 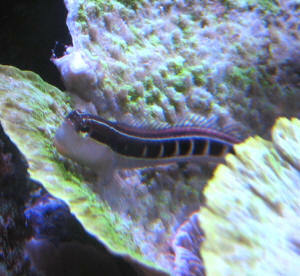 <Always appreciated.> I recently purchased a Ecsenius lineatus as seen in the attached picture. <Pretty fish!> Well, he's a total coral muncher :-( <I'm sorry.> Started with Montipora species, and Birdsnest coral, and has graduated to Acros. <Mmm, he's got good taste!> Just thought I'd share this bit of info. <Thank you!> I'm sure it is very uncommon, but I still think it's something people should be aware of. <Hopefully will help others to be aware.> Thanks. Elegance Stinging soft corals 9/22/05 Hi, Overnight 1 of my circulation pumps detached with the result forced 2 of my coral to land on an elegance. The Helioporidae and Sarcophytons have been stung badly that the 2 has not opened for 2 weeks. Its heartbreaking watching these corals do nothing. Is there anything that I can do to revive these corals? <Not much, may possibly revive on their own. I'd probably do 10% water changes weekly, starting now, to replenish lost trace elements. Keep an eye on them, don't want them dying unnoticed and fouling the rest of the tank. James (Salty Dog)> Thanks Mohamed. Elegance coral risky to fish? 1/2/05 I have a question before I purchase a gorgeous specimen of C. jardinei. I had a terrible experience lately where my rose bulb anemone ate a $150 geometric pygmy Hawkfish the day I got it! I was broken hearted over the loss of such a rare fish. Nonetheless, I have moved the anemone to a different tank <Yikes!! I feel your pain. My carpet anemone has dispatched with about the same dollar amount in various shrimps and small fishes. This is one of the many reasons that anemones aren't ideal community tank inhabitants. Kudos for sucking it up and moving it!> but after thinking this through, what is to keep the stinging tentacles of a C. jardinei from capturing a perching fish such as a Hawkfish as well? Do you guys have any reports of this coral taking fish? Thanks In Advance! <C. jardinei has one of the most powerful stings of any of coral, and is more powerful than even some anemones (Mine has actually raised welts on my fore arm!). That said, fish capture doesn't seem to be a big problem. However, I suspect that most folks are careful not to mix slow moving or perching fishes with this coral, and I would suggest exactly that precaution. Best Regards. AdamC.